Welcome everyone! If you are in the field of GIS/Remote Sensing, you are probably hearing everyone talking about Python and its usefulness in various GIS related tasks. GIS and Remote Sensing are one of the most integrated fields combining skills from different areas such as Computer Science, Engineering, Geography, Mathematics, etc. To become a stronger and more competitive GIS professinal and to increase your value in the GIS industry you need to learn how to program. Python is one of the most spreading programming languages in the IT world and with huge usability in the GIS/Remote Sensing field. You can find many articles mentioning why Python is the future of GIS and how you can get a more competitive salary1 just by learning how to use Python routines. 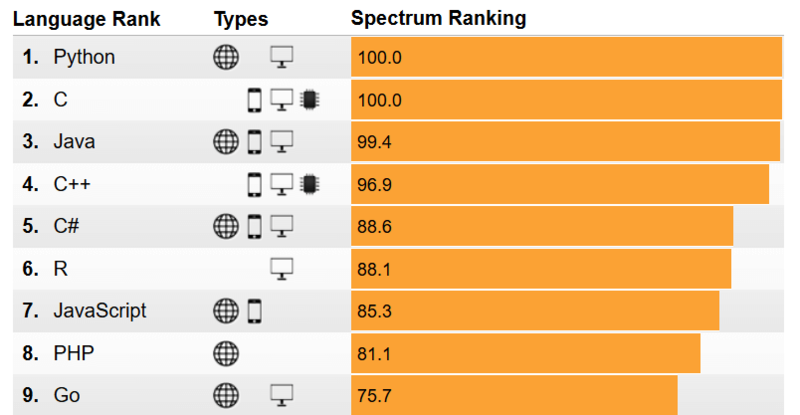 According to the IEEE Spectrum (https://spectrum.ieee.org/static/interactive-the-top-programming-languages-2017) Python is the top ranked programming language!